Trained in all woodwind instruments and educated at Montclair University College of Music. Experienced as Band Leader as well as having played with some of the most outstanding musical organizations including: The United States Military Academy Band at West Point, Glenn Miller Orchestra, Tommy Dorsey Orchestra, Jimmy Dorsey Orchestra, Don Ellis Orchestra, and the Lionel Hampton Orchestra to name a few. Gerry has done arranging for the Lionel Hampton Orchestra, written and done editorial consultant work published by Warner Bros Music. 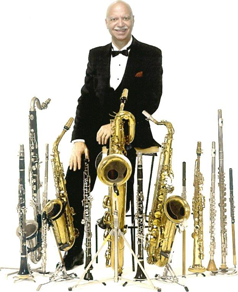 He has appeared with numerous entertainers and musicians including Tony Bennett, Manhattan Transfer, John & Bucky Pizzarelli and Little Anthony and the Imperials.